It seems that the recipe for beating the Boston Bruins is to skate fast, beat them to the pucks on the boards and to goad them into stupid penalties that cause them to be short-handed. 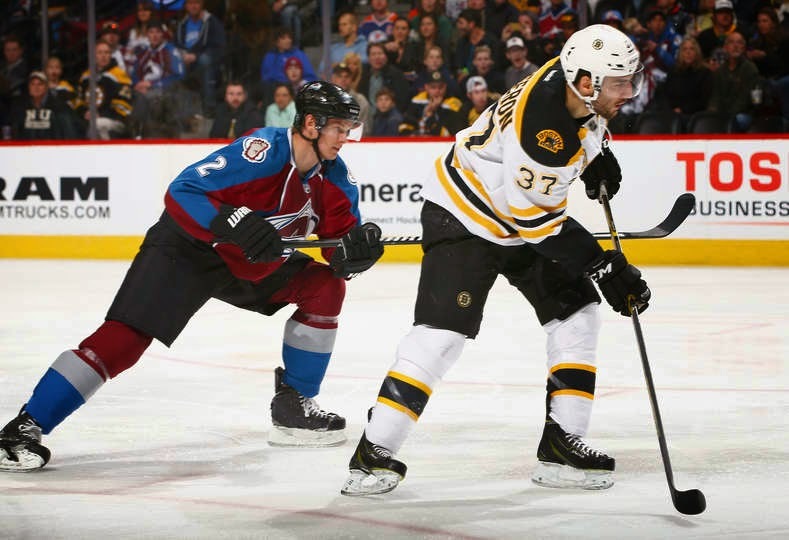 But for it to work, especially during their machine-like ten game winning streak, it takes a full sixty minutes of hell and then hoping that the Bruins make a mistake or two to give you a few point blank chances - and the Colorado Avalanche did just that. ...even though they came out on fire to start the second, the Bruins slowly turned the pace to more of their liking about five minutes in, Carl Soderberg potting a power play goal midway through the period on top of Patrice Bergeron's first period twine tickler as the Bruins took a 2-0 decision in Denver on Friday evening. With the win, the Bruins gained more than just improving their winning streak to a league-high 11 games, but also eclipsed the 100 point mark on the season, tied the St. Louis Blues for the best record in the National Hockey League and, perhaps most importantly, became the first team in the league to clinch a playoff berth. That's a bunch of positive ju ju going on with the boys in the black and gold. ...sweeping a shot into Varlamov's pads, then snapping the rebound past the sprawling netminder for a 1-0 lead at five minutes in that the Bruins' took into the room at the first intermission, but not before Avs' left winger Cody McLeod tried to take the momentum back by dropping gloves with Merlot line centerman Gregory Campbell, but Campbell gave as good as he got and the momentum continued to build for the Bruins. ...the Carl Soderberg and Loui Eriksson Swedish connection on the second power play line playing give-and-go to Avs' goalie Semyon Varlamov's glove side, Eriksson giving up the puck on the dot in the right circle to Soderberg and circling low to provide the screen for the big centerman who wheeled to his right and snapped a shot top shelf over Varlamov's stick side shoulder for the 2-0 lead. So thorough was the Bruins' dominance from that point forward, so solid was Johnson between the pipes, so frustrated were the Avalanche that they couldn't break through the Bruins' defensive effort, that Colorado coach Patrick Roy pulled Varlamov with over five minutes to play in regulation in a desperate attempt at generating anything on the scoreboard. But the best short-handed team in the NHL - and now the best team in the NHL - stood tall and killed off every second to hand the Avalanche their first shut out of the season. Johnson was spectacular in net, stoning chance after chance both early and late, the Bruins' defense not allowing anything to get to him in between, his 31 shots faced just one more than Varlamov handled. The Bruins can add another notch on their stellar season on Saturday night with starting goaltender Tuukka Rask between the pipes, as they catch the red eye to Phoenix to face off with the Coyotes before heading home to take on the hated Montreal Canadiens on Monday - and then the reigning Stanley Cup Champion Chicago Blackhawks on Thursday - their stiffest tests in this stretch run toward the playoffs. And thus far, the Bruins are the only team invited.